"The English country gentleman galloping after a fox - the unspeakable in full pursuit of the uneatable. "- Oscar Wilde in A Woman of No Importance. An overcast Boxing Day in a quintessentially English village/town in South Gloucestershire. The place is typically peaceful, although not so that morning. 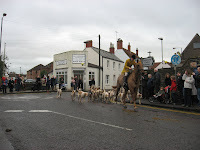 In fact, it looked like a scene from John Constable’s paintings: an excited throng at the village centre; huntsmen and women on their powerful hunters and invigorated hounds prancing at the sound of the bugle; the bystanders cheering wildly with much fervour- setting off towards the rolling countryside is a typical fox hunt. The fox hunt might sound strange to the non-British. It is commonly viewed as a traditional English sport, integral to a country life, complete with high expenses and pomp. Packs of trained hounds pick up the scent of the red fox (Vulpes vulpes) and chases it across the countryside (there being no geographical limitations), followed by riders on hunters. One can easily picture the damage caused by the galloping of horses on fences and hedges on the way and agricultural fields. However, since fox hunting is technically banned in the UK via the Hunting Act 2004 (enforced since February 2005, much to the dismay of the supporters), the hounds now supposedly follow the trail of an artificial scent (an errant fox in their path is considered as an accident). Anti-hunt groups still maintain that fox hunting is rife- after all, no one can keep up with the chase (unless they masquerade as huntsmen) and some have boasted along the lines of getting around the law. Hunt supporters view fox hunting (or any other seasonal hunting) as neither cruel nor wrong. The supporting arguments are many: an important rural English tradition, conservation, and purging nature by eliminating diseased/old/injured/young foxes. A study, which sits on the fence, states that in the event of a fox-hunting ban, there would be no detectable population increase as the number of foxes killed by hunting is relatively small. Furthermore, foxes (which are considered vermin- along with squirrels and rats) haven’t exactly been making themselves endearing- for instance, they indulge in an incomprehensible carnage in hen coops even though all they need is only one hen. As a control measure, hunting is presented as a humane option (when compared to poisoning/shooting/snaring- which entails greater suffering, with other animals as inopportune victims) - whilst the chase itself is said to take just under an hour, foxes are killed (supposedly instantaneously) after a chase averaging 17 minutes. Opponents of the hunt (a list which includes luminaries such as Thomas More, Oliver Cromwell, and Dr Samuel Johnson) finds it nonsensical, cruel, and unnecessary- a sport which transforms the huntsmen into beasts, sans any semblance of human virtues. Fox-hunting has no significant reduction in the fox population and doesn’t provide any sustenance. The only gain (and for those so inclined) is obtaining pleasure from witnessing such unnecessary suffering. One criticism is that the sport is limited to and glorifies the lifestyle of the rarefied strata of society and supporters of a certain political party (admittedly, a glance at my acquaintances who keep hounds supports that statement). So here it is- an exclusive sport, a mixture of violence and sentimentality for olden traditions, transporting one back into feudal times. Any thoughts?